Once you have the Discounted Upsells app installed, creating an offer is just a few simple steps away. Step1. Launch the app and click Create an Offer. 1. Select the products to upsell - In this section, you can choose the product(s) to upsell. You can upsell more than one product but the customer can only choose one of them to purchase at a time. If there are two or more products, the customer cannot also mix and match when they avail of the upsell. Click Next afterward. 2. Set the discount value - This section lets you choose the discount value of the product that you want to upsell. You can choose a discount percentage, a certain discount amount, or a fixed discounted price for the product, then click Next. 3. Select trigger products - In this section, you can choose which product(s) will trigger the pop-up box that upsells the product(s) you have entered in #1. The same rule about mix and match in #1 applies to this section. Click Done once completed. Step 3. 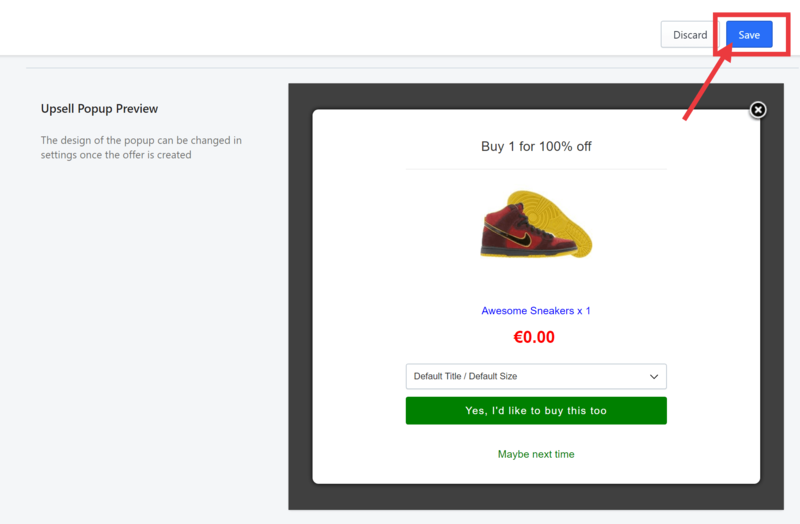 The Upsell Popup Review section will then give you a preview of the pop-up box that will appear for the product upsell. Once satisfied, click Save to complete creating the offer. If you have any questions, click on Contact Us below.